Fabric Replacement | Lightweight Manufacturing Inc.
Engineering support based on knowledge of the most common systems in the industry. Creative dismantle and reskin options to minimize downtime. Relationships with specialized turnkey contractors who will work directly with you. 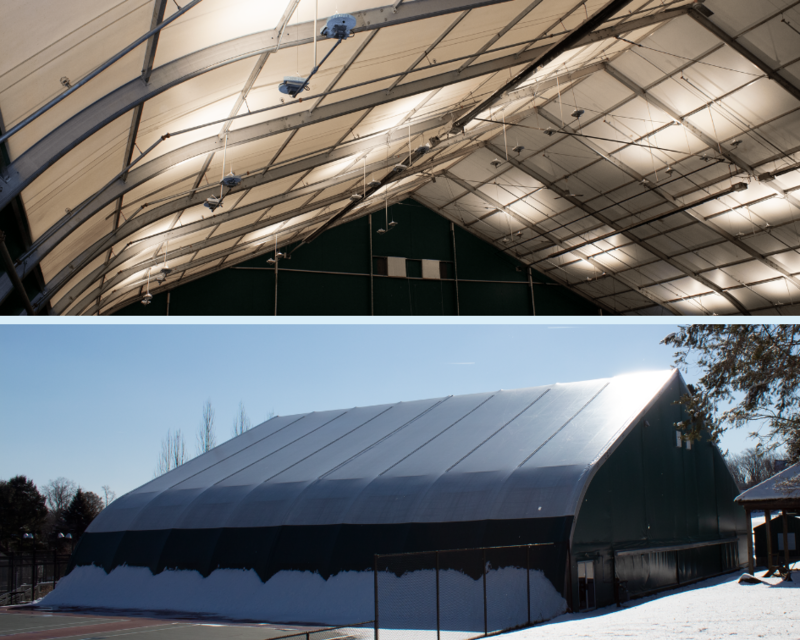 For many existing fabric structures, the original installation method is not the most efficient way to reskin the building. Whenever frames have to be detensioned, the cost associated with removing liners, electrical and other inside hanging systems can often be avoided with an alternate installation method. Most importantly, there are options to reskin without disrupting the inside structure. Consider the positive cash flow effect from a continual revenue stream with a fully operational structure throughout the fabric replacement project. When the fabric is replaced on an existing structure, the building looks essentially brand new while only a fraction of the total cost of the building is replaced. In many cases, it is desirable to replace the fabric on an existing structure using a different attachment method, tensioning method, or fabric style than what was used in the original construction. This can be for reasons of limited access, not having to dismantle electrical and other utilities on the inside, potential damage to the floor inside, avoiding replacement of internal finishes, downtime minimizing or creating a better performing structure than what was originally built. We support owners and turnkey contractors with finding the optimal solution for their fabric replacement projects. Fabric replacement on a tensile structure can be quite challenging. In many cases, the owner does not have the original engineering and design information. The fabric has a structural role in a tensile structure, and the analysis is sensitive to the design assumptions such as prestress which may not be available; therefore the replacement project requires an engineering process. Recreating the original design is only the first step. Quite often an engineering effort is required to ensure that the fabric replacement project is based on solid engineering assumptions and that the existing frame and foundations can be re-used. We provide support both with the engineering and design efforts and with fabricating the tensile cover and any other replacement parts. Need helping deciding on the right fabric? Please fill in the form below, email us, or reach out to one of our experts at (610)435-4720.